St. Charles Lwanga was born in 1860 in the Kingdom of Buganda in the southern part of modern Uganda. He served as a page and later as a major-domo in the court of King Mwanga II. As part of the King’s effort to resist foreign colonization, he had begun to insist that Christian converts abandon their new faith, and executed many Anglicans and Catholics between 1855 and 1887. Many of those that were executed were officials in his Royal Court or otherwise very close to him. Among those executed was Charles Lwanga, and the Catholic Church recognizes him as a Ugandan Catholic Catechist martyred for his faith. His feast day is June 3rd, and he is venerated on the Liturgical calendar. The persecutions started in 1885. After a massacre of Anglican Missionaries, who included Bishop James Hannington, the leader of the Catholic community, Joseph Mukasa, who was then major-domo of the court, as well as a lay catechist, reproached the king for the killings. Later that day, Charles Lwanga sought baptism as a Catholic by a missionary Priest. On May 25, 1886, Mwanga ordered a general assembly of the court. He charged two of the pages, which were condemned to death. The following morning, Charles secretly baptized those in his charge, who were still only catechumens. Later that day, the King called a court assembly, in which he interrogated all present to see if any would renounce Christianity. 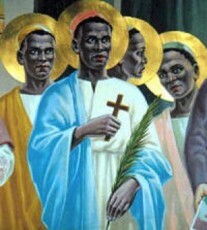 Led by Charles Lwanga, the royal pages declared their fidelity to their religion, upon which the King ordered them, bound and condemned them to death. Two of the prisoners were executed on the march to the traditional place of execution. On June 3rd, the Guardians for private execution separated Charles Lwanga from the others. As he was being burnt, Charles said to the Guardian, “It is as if you are pouring water on me. Please repent and become a Christian like me”. Twelve Catholic boys and men, and also nine Anglicans were burnt alive. The anger of the King was particularly inflamed against the Christians, because they refused to give into demands to participate in sexual acts with him. Charles Lwanga, in particular, had protected the pages from King Mwanga’s sexual advances, angering the King. The executions were also motivated by the King’s efforts to avoid foreign threats to his power, and he seen the Christian Missionaries as a threat. Charles Lwanga was burnt alive and martyred for his faith on June 3rd 1886, along with other Catholics. Pope Paul VI canonized him and his companions in 1964.